When hype overpowers performance and here ladies and gentlemen is Exhibit A: Mr. Mitchell Moses. According to a report on Wednesday afternoon, Wests Tigers five-eigth Mitchell Moses has knocked back a $3million, three-year deal to stay at the club and has requested an immediate release to join the Parramatta Eels. According to Moses, he simply wants to play in a winning side. He’s sick of losing. Ironic indeed because if Moses and halves partner Luke Brooks had started to show the potential that led Wests Tigers to letting Blake Austin and Te Maire Martin go, Moses wouldn’t be worried about victories and finals spots. He’d have them already. “It has nothing to do with money. Money is the last thing on my mind,” Moses said last week. “First thing is I want to be playing good footy in a good footy side. “That’s the biggest thing for me. “As long as I’m playing good footy and enjoying my footy, the money doesn’t matter. Takes its toll on fans, coaches and teammates too Mitch. But the warning signs were there earlier this year. Moses played some good footy at the end of 2016 but surely not enough to warrant talking himself up for a New South Wales jersey? “If I am playing good footy for the Tigers that is all I can control,” he said in February. It isn’t his fault to begin with. At first you buy into the club culture, you’re a rookie, it’s humbling just to play first grade. But then the entourage start whispering in your ear. Friends, family, managers all start telling you you’re a gun. Maybe travelling better than you are. That you’re the best player in the side and you’re worth more than you’re currently on. It all adds up. Before you know it, you’re not buying into the game plan, you’ve got your own ideas and it’s everyone else’s fault the team isn’t winning. Those whispers become deafening and before you know it the hype is blocking out the performance. You’re knocking back $3million you aren’t entitled to because you want out of a losing side. Maybe it isn’t about money like he said. 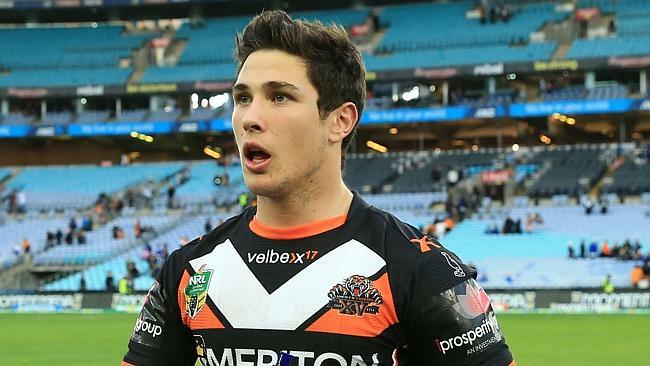 But even if it isn’t, the hype must be so loud around Mitchell Moses that he can’t see that it is he that needs to improve – not just the Wests Tigers. It also isn’t his fault that the media has continously, over and over and over again, dubbed these men the “big four”. In print, TV, radio, online. Hell, even the great Des Hasler called them the “big four” the other day. It makes the job of Isaac Moses, the uncle of Mitchell and manager of ALL FOUR players, way to easy. He can walk into any club he wants and say, “Hey! Haven’t you seen the papers?” – it’s crazy! There may however be a silver lining for Wests Tigers fans. If Moses is in fact going, that’s an extra $1million per season you can spend somewhere else. Moses may well develop into a star but he hasn’t proven it yet. He was never worth $1million. It’s Parramatta’s problem now. Would you invest your own coin, a cool $3million, in something that was a 50/50 bet? This could be the best thing to happen for Wests Tigers.